DATUM POINT, or simply "DATUM", is an archaeological term used to describe the standard "anchor" at an excavation site from which all measurements are made. The measurements are for both height and width. Because DATUM is utilized for both vertical and horizontal measurements, it is reminiscent of a CROSS. 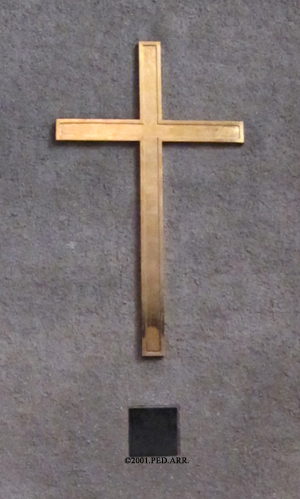 When I first saw this CROSS in 1998 on the interior backside of the Holy Door in St. Peter’s Basilica, Vatican City, I immediately thought of “It is finished!”, with an EXCLAMATION POINT! The one-time sin offering and forgiveness by Jesus Christ removes all confessed sin from everyone, for all times. We do not deserve it, we cannot buy it and we cannot earn it. It is a free, but priceless, gift. All we have to do is accept it by grace, through faith! DATUM ENTERPRISE, LLC arose from this concept and has patterned itself on seeking out and exalting the Truth as depicted in Jesus Christ, Who said, "I am the Way, the Truth and the Life. No one comes to the Father except through Me." Throughout history, Jesus Christ has been recorded in Sacred Art and depicted on ancient artifacts. This is the venue for DATUM ENTERPRISE research. And, just like the mosaic background of the DATUM ENTERPRISE banner above, this research endeavor has been like fitting an individual tessera, or piece of the mysterious "puzzle", into something more recognizable and part of "the bigger picture." The abundance of forensic circumstantial, documentary and physical evidence presented herein, and coupled with the research findings of numerous others, might lead a reasonable person to believe the Shroud of Turin is authentic, and which actually bears the Image and Blood of the Man known as Jesus Christ...the GOD-Man, the Incarnate Creator of the Universe and Savior of mankind. Although this independent research has yielded several new and unique discoveries, "there is more…much more!"